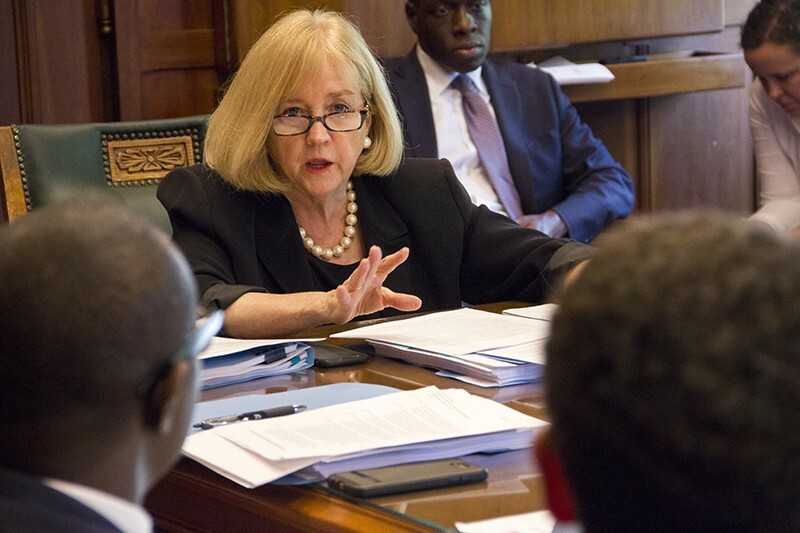 Mayor Lyda Krewson was clearly frustrated by the end of the Estimate and Apportionment meeting. Wednesday's meeting of the city's powerful Board of Estimate and Apportionment didn't go the way Mayor Lyda Krewson had hoped. Instead of signing off on hiring a consultant to explore leasing Lambert-St. Louis International Airport to a private company, the board punted, agreeing to delay its vote until an undetermined later date. Following the board's failure to cast a key vote to ink a contract between the city and an array of airport privatization consultants, Krewson remarked that another attempt is "pretty doubtful at this point." 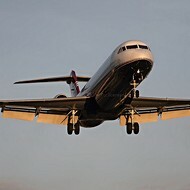 The surprising development came after months of efforts from the mayor's office to sell city officials on considering a lease of the city airport — and get them to approve a plan to put the search process partially in the hands of a non-profit funded by conservative philanthropist Rex Sinquefield. Sinquefield's role helped stoke controversy in February, but since then, discussions about privatization have taken place largely behind the scenes — that is, until this week, when the hire of the privatization consultants finally appeared on the agenda for the monthly meeting of the E&A board. The three-member board — comprising the mayor, of Aldermen President Lewis Reed and Comptroller Darlene Green — must approve all city expenditures, even, as in this case, when consultants would only stand to profit if the city successfully leased its airport. Krewson said she went into the meeting with a commitment from Lewis Reed, that "he had gotten what he needed" to approve the contract. As it turns out, that wasn't the case. "Today had some surprises," she said. "He had some more demands." During the meeting, any sense of consensus was derailed just minutes after the matter was introduced to the board. First, the disagreement focused on five amendments to the contract, added by a selection committee earlier that day. Reed indicated that he had expected additional amendments to be passed as well. Krewson seemed confused by his assertion. "Honestly we put these in because we believed this is what you wanted," she told Reed at one point. The meeting later bogged down as Reed voiced concern about the transparency and membership of a "working group" to be staffed with appointees selected by members of the E&A board, as well as budget director Paul Payne. The working group would operate alongside the consultants as they try to find an airport lessee. 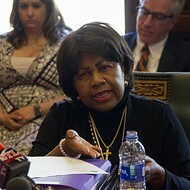 Comptroller Darlene Green also flatly said she wasn't ready to approve the contract. Her issue was a provision that seemed to award the working group authority to act on behalf of the city, legal language that she warned would conflict with the city charter. After a recess, Linda Martinez, the deputy mayor for development, told the board that staff had taken a look at the complaints, and that problems could be addressed. They were "really close on a couple issues," Martinez said, adding that the additional amendments could be written by the end of day Thursday. 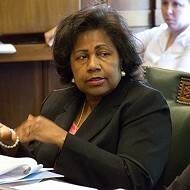 Darlene Green also supported a delay. "It is clearly not worked out, and it doesn’t appear that it is going to be worked out today," she said of the contract. "I’m not prepared to vote." 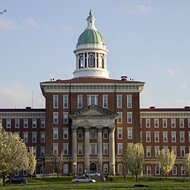 Since the contract wasn't voted on, a copy wasn't made available to the public (or the media). Reed's specifics concerns are difficult to analyze — we don't know what exact amendments he's referencing, or, for that matter, what other amendments he's now insisting must be implemented. In any case, Reed insists those changes are essential. "The re-format of that working group is critically important," he said after the meeting. "It has to happen, because when we’re working in the public forum you have to have a process attached, that’s accountable, that’s definable." But whether that process will ever get remotely close to completion the airport is now an open question, and maybe moot. Even Krewson, a vocal proponent of exploring airport privatization, is now openly doubtful of seeing even that first careful step. The meeting seemed to wear on the mayor. At several points in the meeting, she commented on the administration's steady efforts to refine the contract for the consultants. After the meeting, she again noted the time spent trying to hash out the details. Today was supposed to be day they actually got approval, instead of just bickering and delaying it yet again. "This airport situation is a very big thing to consider," she said. "None of these things come together instantly, but the one thing you have to do is start. Today we failed to do that." Airport Privatization Has St. Louis Surveying an Unexplored Frontier. Who's in the Pilot's Seat?